Our first morning in Venice involved a little bit of adjustment due to jet lag. The disruption in our schedule the previous day was also going to make this our first chance to really see the city. The tour group got us started with a good breakfast in the hotel’s restaurant. There were no real surprises with the food except for the coffee machines. They were capable of producing coffee in a bewildering number of ways except for the one way that we were familiar with. We had to figure out how to use the machines. We had to use some ingenuity to manage the machine to get the consistency of what is called cafe americano. Europeans drink a much stronger coffee than is common in the USA. I had a few minutes to go to the back of our hotel (along the Grand Canal) before we started our morning visit to the island of Murano to get my first glimpses of Venice in the daytime. The sun had not yet risen completely. We had to walk to an area beyond the railway station to catch our boat to Murano. This was what it looked like in front of the station. 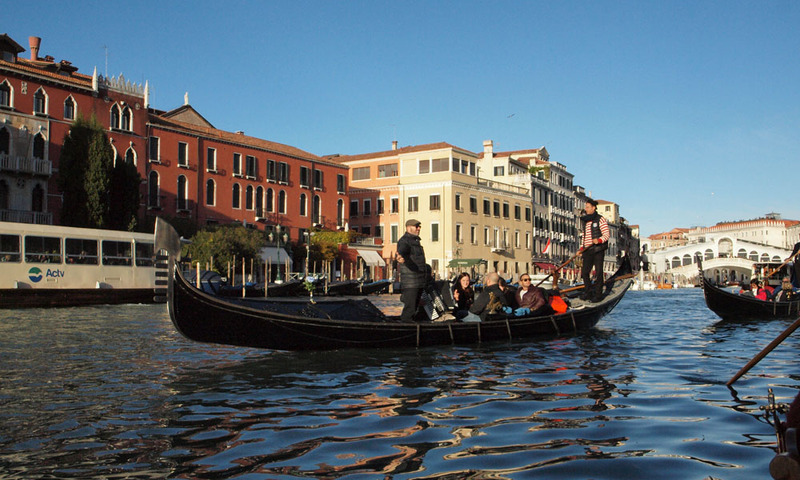 Venice is still a bustling city in spite of the fact that the population is decreasing and the city is sinking. Tourism keeps it going. It was a busy commuter day, with the water buses plying their business getting people to different work destinations in town. Our boat to Murano entered the open waters beyond the island after passing the dock for the cruise ships that visit. We could see the shoreline of Venice as we entered the waters beyond the island. You can see bridges at the entrances to canals, and water buses operating along the shores. The picture below, taken from the waterway, is of the Doge’s Palace, and the tower at Piazza San Marco. We were scheduled to stop there on our way back from Murano. You can see that the waterways are the lifeline of the city. Here is a ferry. The police get around in boats. Murano itself is well known for its glass works. After our arrival at the dock we visited a place where glassware is made. We got a demonstration. The gentleman in the pictures below made two items for us. The first one one was formed by a process that involved shaping the glass while it was being rotated at the end of a long rod. The second item, which used colored glass, required other more intricate techniques to stretch and shape it. He started this work with a round piece of glass and finished with this exquisite shape in less than ten minutes. After the visit to the factory, we returned to Venice and disembarked within walking distance of the Piazza San Marco and the Doge’s Palace. On the way to the Doge’s palace, we passed by the Bridge of Sighs, the bridge that offered convicts their last view of Venice before imprisonment in the building next to the palace. We took a tour of the Doge’s palace, with its massive ornate rooms with artwork and decorations everywhere. Our tour guide described the history, architecture and art of the place. We also visited the prison across the Bridge of Sighs in the later part of the tour. The Chamber of the Great Council in the Doge’s Palace shown below is reputed to be one of the largest halls in Europe. It is hard to imagine that large structures like these built on a foundation of wooden pilings driven into the ground below the sea still survive. After the tour we took a break to have lunch and relax in the piazza. Here are a few pictures from the piazza. The first one is of St. Marks Basilica. We did go inside the church earlier as a part of our tour. The interesting thing is that while it is still in use, it is unstable, with the floors all warped, and with water entering the church from below the floor when the waters in the city are high. This is our group from Gaithersburg. The picture was taken by Alessandro. This is a view of the piazza. Then it was time for our gondola ride. After riding initially through some of the narrower canals, we entered the Grand Canal in the area of the Rialto Bridge. The grand canal was busy and we passed many water buses. We were entertained by a singer and an accordion player who were on one of the boats in our group. Then it was back into the narrow canals to get back to where we had begun the ride. I took note of the effect of the rising waters on some of the buildings. We saw maneuvers like this a few times during the ride. After the ride we hung out near the Piazza San Marco for some more time. We started our way back to the hotel on foot as the sun began to set. The picture below is the view we got of the Grand Canal from the Rialto Bridge. The restaurant along the canal in the picture below appeared to be open for business. The buses were still plying the grand canal. There were a lot of people around, walking past the brightly lit shops on the Rialto bridge. We walked through a few other shopping areas. We had to figure out dinner plans after we got back to the hotel. This was one of the few nights we were being left to our own devices without something being scheduled as a part of the tour. Some of us were still suffering the effects of jet lag and chose to stay behind in the hotel while the rest of us went out to look for a place to eat. Our selection for a restaurant that night turned out to be the only really bad choice we made with regards to food and drink during the trip. But that was OK. We were too tired and quite happy to get some sustenance before we headed back to the hotel to get some shuteye. We had an early departure to Florence scheduled for the next day.